I would love to make a denim dress with this colorful fabric as a vest and tie-backs for my three year old. The denim would have to be the same soft blue as the measuring tapes in the fabric.It would be perfect since she always insists “But I’m biiig!”. She would have the measurements to prove it right on the spot. i’d make this into a pleated skirt, might ook nice… and keep the rest of the outfit VERY sober of course. this is hard to pull off as an all-over look. 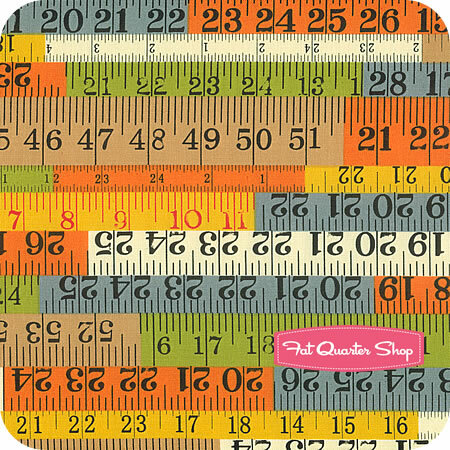 I like it–the colors are great.I’d say a dress or shirt using the rulers vertically would be fine. A big poofy skirt would be excellent, maybe with a solid-color bodice and ruler pattern collar. And the buttons would be big, plastic, and either the orange or the green.Most likely, I’d buy it and it would end up on the shelf with all of my other crazy prints that I love but have no idea what to do with, such as the red with Chinese takeout boxes and the white with the “Mice-a-roni” print. i go with cassandra – a full skirt! then I could tone it down a little with a plain cardi set. I love it though! I am in the group that loves this fabric. The idea of chevron stripes, or running the pattern vertical and into a pleated skirt it perfect.As for buying more fabric – just having the goal of restraint is lofty. Oh my God I MUST HAVE! I’m going through a very punny stage, anyway, so it’s perfect. The only thing is I’d want them all vertical… you know… but that is some of the most ADORABLE fabric I have EVER seen in my life EVER EVER!! There are so many answers! A smock for a preschooler. A fun skirt for a little girl. A great tote bag. A skirt for me. Wall art. A sewing machine cover. I could go on, but I will stop now. Hello, I am new to your blog, but I really like it. I found it from your Dictionary Evangelist blog, which I found from listening to your talk at TED – which was great.Anyway, I think that your fabric would make a good pencil skirt if it was vertical tapes, but the horizontal might lend itself to tote bags, as others have said. This year, my one and only resolution is “don’t buy any more fabric”. Of course, I look back to last year’s new year’s blog entry and see, “don’t buy any more fabric”. See how well that one did? I wish you the best of luck! I’d use this fabric with some acrylic medium and make the cover of a hand bound journal with it.If made to make clothing out of it, I’d opt for “burn it”. I’d also be leary of wearing a fabric that measured me around.. lol BUT Maybe it would look alright as a dress if you used it vertically instead of horizontally.I also like the idea of curtains for a class room! Math teacher vibe for sure!One thing’s for sure. I would never keep it on my desk else I’d be trying to grab at it thinking it was one of my *many times lost* tape measures. hahaha! I think an apron or half-apron would be a very sweet use of it. I can’t tell the scale (actual inches? Or FAKE inches?) but it looks pretty busy for a dress. for lining a denim suit jacket (that I would take on and off alot!) For practical purposes, I love this idea best! I also like the idea of the pleated skirt, with the pattern running up and down….lots of verticals, and the extra ones would expose themselves as you moved!I don’t consider this print too busy, because the colors are muted and the repeat pattern is basically stripes. I wouldn’t be afraid of a slim, lightweight suit made up in this. In fact, I would probably wear it to death, as a “Lipstick Librarian” look. Hmmm….this fabric screams “grade school” to me so I would make book covers or pencil cases out of it. I like your shirtdress idea! But..I am thinking of a fun, simple a-line skirt with a classic white, or yellow, t-shirt and white converse/keds. Hmmm…sounds good…I might order some! As long as it doesn’t actually measure my hips! OT, but hopefully you’ve already pre-ordered the reprint of Claire McCardell’s book? I saw it on fashonista.com and thought of you. It comes out on March 5th. I’d wear it in a shirtwaist dress.. or lining as someone mentioned 🙂 Love it!It’d make a fun belt too. For novelty’s sake. I would use it to make a slip for my dress mannequin. I think it would look quite querky. Think I’d make an A-line skirt in navy cotton and use this on the inverted pleats so you’d get a flash of it without it being overkill! Its cheerful anyway. annet, exactly. For me I tone down most things, and only because I made a wild dress recently, but the remaining will soon be a princess sleeved blouse for jeans. I’d wear it in dress form, but with everything else in black– shoes, tights, cardigan, purse– maybe even a black scarf or hat. I never seem to tire of contrasting a crazy print or color against all-black. It would be a fun summer playdress, too. Whatever I made from this fabric, it could not be clothing for myself. My resolution for New Year 2004 was to never again buy or wear clothing with horizontal stripes. This may be the only resolution I’ve ever kept in my life. I just bought this same fabric for my 19yo daughter..at her insistence, I am making a ruffled mini out of it! Go figure! I think it’s lovely and I would definitely wear it! One of the other comments mentioned it might be nicer to run vertically instead of horizontally and I agree!But I think it’s a great material. Perfect for a shirtdress – or maybe one of your Duros? I like it I think it’s quite funky.Fun arpon. I think a very tight pair kneelength shorts (that emphasis bottie width and thigh girth). Pair them with some black socks that come half way up your calf and that should complete the humiliation, I mean look. A School Bag! Or mayybe a pencil case!